The famous Baker™ Plaid is now available in halters! The Baker Halter features a full leather crown piece. Brass plated hardware. 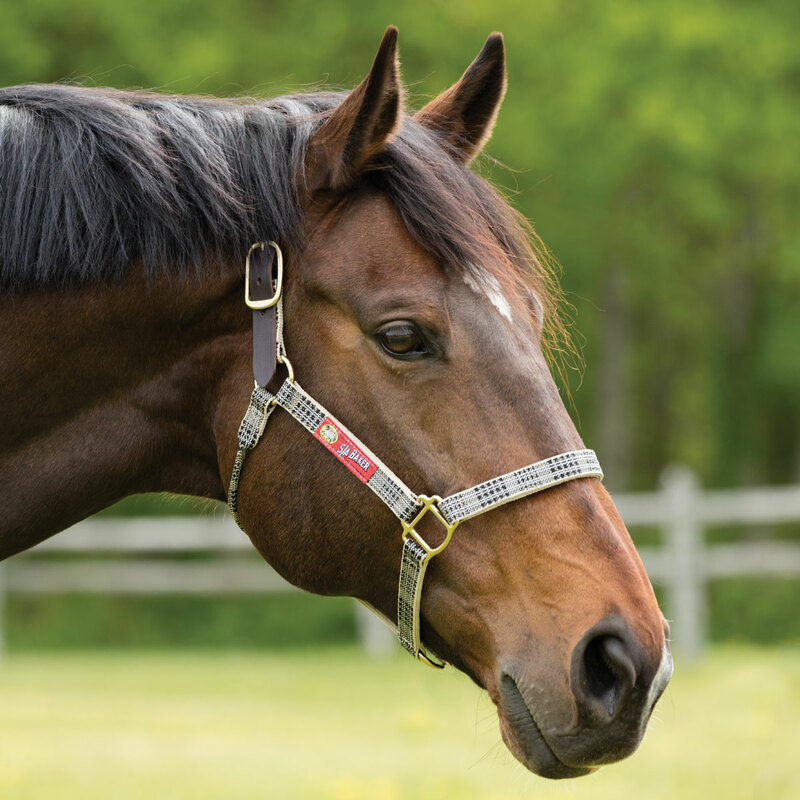 As with all Baker products, the Baker Halter is made in the USA. Original plaid. Baker™ Halter is rated 4.5 out of 5 by 109. Rated 5 out of 5 by Xeno0323 from Durable & Attractive My horse has worn this halter for turnout for over one year and it has held up very well. Rated 3 out of 5 by BesteHanX from Looks fine, material is a bit rough This halter is perfectly serviceable and looks just fine on my boy. The breakaway does indeed break, and pretty easily for that matter, it's definitely on the thin and chintzy side. The material surprised me in that it's a bit rough would borderline hard edges to the point that I'm seriously considering getting some kind of fleecy covering for the nose band. I have no doubt it would rub the hair off if he spent more time in it. Rated 5 out of 5 by fatfriesian from Really cute! Love this halter! Good quality and fits my TB well. Would definitely buy again. Rated 4 out of 5 by Kristin from Nice halter, but does not match Baker blankets Giving 4 instead of 5 stars because this halter - which is tan with black and lavender plaid - doesn’t match the traditional baker plaid blankets and sheets. Disappointed that item does not match my blankets, but quality is good. Rated 5 out of 5 by FivePointFarm from Nice Looking and True to Size This is a sharp looking halter and it fits well. We'll see how it holds up to turnout and regular use. Rated 4 out of 5 by tia2ala from So handsome! Purchased this for my OTT, needs a little breaking in to hang right, but it still looks gorgeous on him! Plus it is made in America which makes a deal for us. Rated 5 out of 5 by Lisa L from Very Handsome! I got this halter for one of our rescues to make him feel special! It worked! He looks so handsome in it! Love the quality! Rated 5 out of 5 by Mikeys Mom from Good Looking Halter This is a great light weight "at home" halter. Would not recommend using this as a shipping halter where absolute security is a must but I love the Baker plaid look for everyday use. Rated 5 out of 5 by Emma from Nice I like these a lot. They hold up well to 24/7 use (and these horses love to play). The nylon is stiffer which I actually prefer because it creates less pressure on their poll/face. The leather of the crown piece is soft right out of the box and is long enough to accommodate many different size heads. It's true to size (cob fits my 15.2 & 15.3 TBs perfectly, horse fits my 16-17.2hh group). I love how the clasp on the throatlatch still works even when it's coated in mud (other halter's the clasp gets jammed with mud). Overall, these are awesome. I think I found my new go-to breakaway halter! Rated 4 out of 5 by Cheryl from Attractive looking halter! We like the Baker products and bought this halter because we knew it would look great on our Bay colored Trakehner and it did!